In 2004 the Roman Catholic Archdiocese of Boston announced plans to close or merge more than eighty parish churches. Scores of Catholics―28,000, by the archdiocese’s count―would be asked to leave their parishes. The closures came just two years after the first major revelations of clergy sexual abuse and its cover up. Wounds from this profound betrayal of trust had not healed. In the months that followed, distraught parishioners occupied several churches in opposition to the closure decrees. Why did these accidental activists resist the parish closures, and what do their actions and reactions tell us about modern American Catholicism? 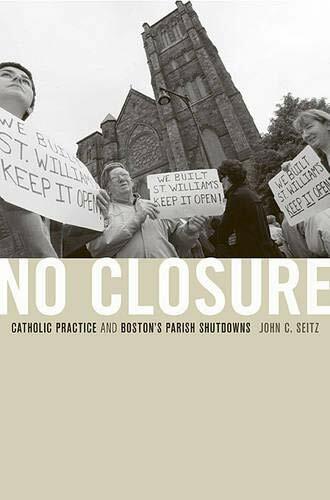 Drawing on extensive fieldwork and with careful attention to Boston’s Catholic history, Seitz tells the stories of resisting Catholics in their own words, and illuminates how they were drawn to reconsider the past and its meanings. We hear them reflect on their parishes and the sacred objects and memories they hold, on the way their personal histories connect with the history of their neighborhood churches, and on the structures of authority in Catholicism. Resisters describe how they took their parishes and religious lives into their own hands, and how they struggled with everyday theological questions of respect and memory; with relationships among religion, community, place, and comfort; and with the meaning of the local church. No Closure is a story of local drama and pathos, but also a path of inquiry into broader questions of tradition and change as they shape Catholics’ ability to make sense of their lives in a secular world. _No Closure_ explores the power and the limits of the optimistic post-World War II celebration of detachment. It explores the experiences of people who find themselves standing beyond edges of this way of thinking about life. The people I write about took social, personal, and religious risks in violating these truths, in opting for attachment. But on the other side of that boundary are potent family memories, special, inviolable places on an otherwise homogenizing landscape, the idea of continuity from past to future, and the hope for a modicum of control over what happens in life. This is the dilemma raised by parish closures. I think we can all benefit from traveling along this boundary line ourselves; such journeys provide a chance to consider what we--as individuals and as communities--are willing to 'let go' and what we think should be preserved.